This composite image showing the constellation Ursa Major offers a glimpse of what students may see above them in the planetarium. Photo by August Jennewein. All images courtesy of UMSL Daily. 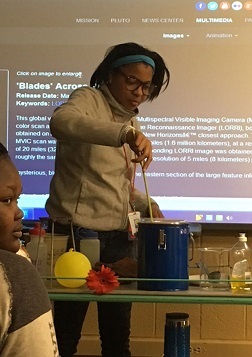 During the classroom presentation at UMSL, Ferguson Middle School students learned about comets, jokingly called “dirty snowballs.” Later, a UMSL student made one out of soil, dry ice, water and ammonia. Photo provided by Gina Pereda. 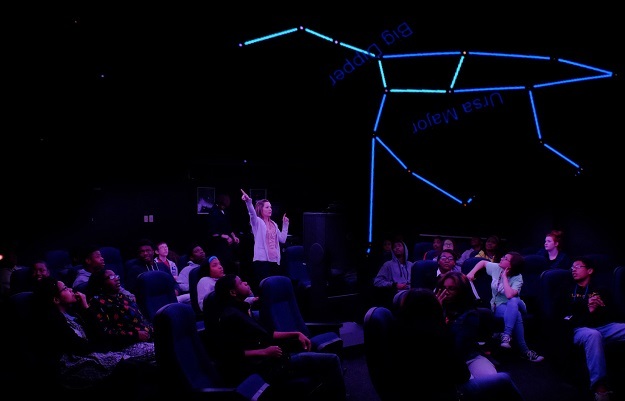 A collective, audible surprise came over the visiting class from Ferguson Middle School as the planetarium at the University of Missouri–St. Louis lit up with constellations above their heads. “Does anyone know what this is?” senior physics major Tianna McBroom asked of the class while pointing to a familiar pattern of stars in the dome’s night sky. McBroom took the opportunity to teach them the difference between a constellation and an asterism, a commonly recognizable pattern of stars but not necessarily a constellation in and of itself, although it may be part of one. She traced out the constellation Ursa Major, or the Great Bear, showing the students how the Big Dipper makes up its back and tail. Around the room, pointed fingers were in the air as students traced the star patterns for themselves and whispered among each other. For McBroom, it was one presentation in a series she will give over the next year as the incoming student coordinator for the UMSL Astronomy Outreach Program. The program, free to local elementary and middle schools, offers students an opportunity to explore space through a planetarium presentation and classroom presentation at UMSL. This year, the UMSL program also partnered with the Challenger Learning Center so that the students had the opportunity to experience the CLC’s Simulated Space Mission as part of a comprehensive field trip. Funding by the NASA-Missouri Space Grant Consortium helps support UMSL students who serve as the program’s student coordinators. It also pays for the program fees and busing of the elementary and middle school students.